How Sunday school and Bible club teachers interact with their students has been compared to the job of a counselor, adviser, peer, and coach. But perhaps the best description of a Bible Club leader is as an architect. An architect designs buildings, planning for physical stress, making them as functional as possible, and creating them to be pleasing to look at. But once the design is finished, the architect’s role stops. He has to let other people lay the brick and pound the nails. He has to let other people live and work in the buildings whether or not he likes how they live and what they do. An architect may work on a project for months or even years, so his job requires patience and endurance. Yet the architect is simply a planner; others will actually create the building and use them. Yet often the architect is blamed if something goes wrong. In many ways, a Bible Club teacher’s job is similar to the role of an architect. It takes patience and endurance. 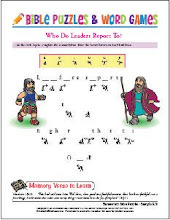 A Bible Club leader can only influence the students with which he or she works; the students will be the ones who decide how they will respond to the “plan” the Bible Club leader has presented to them. • Lead weekly Bible Club meetings. • Plan and help lead parties and special activities. • Work closely with the students (and parents) in creating meetings and events that interest them and help to meet their needs. • Get to know each child in your group by name. Visit your children in their homes. Invite them to your house or to the church for a special activity or party. • Develop a solid relationship—with each child. Be sure all children are nurtured—not just a few. • Have periodic prayer and sharing sessions with the pastoral staff of your church. Communicate victories and needs with them for their prayer and assistance. • Personally pray regularly for each student individually and for your Bible Club ministry in general. • Faithfully attend the services of your church, not only because you need the spiritual nourishment, but also because you are an example to the children who are watching you. • Live an exemplary, Christ-honoring life before your students. “Developing caring, Christian relationships” best sums up the role and results of effective Bible teaching ministry. The leader or teacher who establishes and nurtures Christian relationships with students and their parents, while growing in his or her own relationship with Jesus Christ, will experience great joy and effectiveness as a leader, teacher, and servant of the Lord.